HomeGovernmentWhy Is Nikki Haley Still Trump’s UN Ambassador? It’s unclear whether she is speaking for herself or the White House. I went to a meeting the other night with some Donald Trumpsupporters who, like me, had voted for him based on expectations of a more rational foreign policy. They were suggesting that the president’s attempts to move in that direction had been sabotaged by officials inside the administration who want to maintain the current warfare state. Remove those officials and Trump might just keep his pledge to leave Bashar al-Assad alone while improving relations with Russia. I was somewhat skeptical, noting that the White House had unilaterally initiated the April 7 cruise missile attack on a Syrian airbase as well as the more recent warning against an alleged “planned” chemical attack, hardly moves that might lead to better relations with Damascus and Moscow. But there are indeed some administration figures who clearly are fomenting endless conflict in the Middle East and elsewhere. One might reasonably start with Generals James Mattis and H.R. McMaster, both of whom are hardliners on Afghanistan and Iran, but with a significant caveat. Generals are trained and indoctrinated to fight and win wars, not to figure out what comes next. General officers like George Marshall or even Dwight Eisenhower who had a broader vision are extremely rare, so much so that expecting a Mattis or McMaster to do what falls outside their purview is perhaps a bit too much. They might be bad choices for the jobs they hold, but at least they employ some kind of rational process, based on how they perceive national interests, to make judgments. If properly reined in by a thoughtful civilian leadership, which does not exist at the moment, they have the potential to be effective contributors to the national-security discussion. 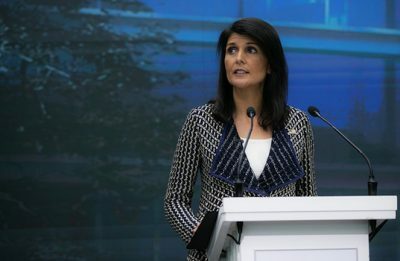 Haley responded yes, that the administration is “supporting Israel” by blocking any Palestinian from any senior UN position because Palestine is not recognized by Washington as an independent state. 1 Comment on Why Is Nikki Haley Still Trump’s UN Ambassador?